On 8 September, Prime Minister Narendra Modi while attending the 14th India-ASEAN Summit and the 11th East Asia Summit met US President Barack Obama at Vientiane, Laos on the sidelines of the events. "Two democracies and a defining partnership of our era! PM meets President Obama @POTUS on sidelines of EAS," tweeted Ministry of External Affairs (MEA) official spokesperson Vikas Swarup. Though both leaders had met during the ASEAN Summit here and the G20 Summit at Chinese city of Hangzhou, this was the first one-to-one meeting between them. 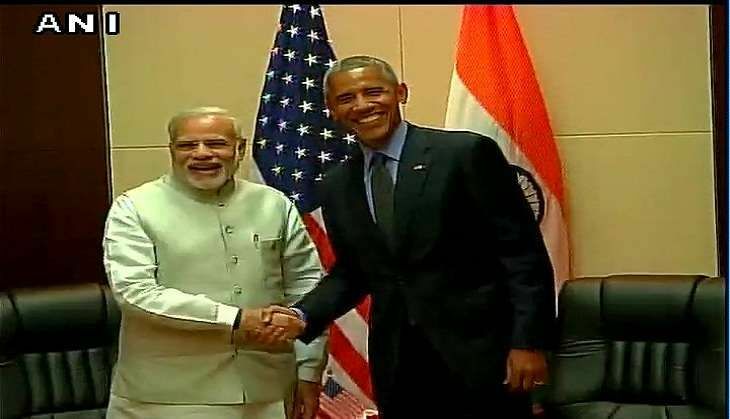 The White House yesterday said that President Obama will hold a bilateral meeting with Prime Minister Modi. Today's meeting is said to be the eighth meeting between the two leaders in the last two years. The duo had first met at the White House in September 2014 when Prime Minister Modi travelled to Washington DC at the invitation of the US President. The meeting is a significant one as it is likely to be their last official engagement together with Obama's presidency set to end next year.